Vinyl Digital Exclusive - Limited to 500 hand-numbered copies! 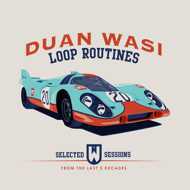 Duan Wasi delivers Porsche 917K Monza '71 styles on his upcoming LP "Loop Routines" by presenting selected sessions done at the Porsche museum in Stuttgart. The producer is a German hip hop legend which had a big influence on the scene with his work. Duan Wasi: "Le Mans" - wenn Porsche Sound zur Musik wird!